A bright and colourful model of Guanlong, a fierce predatory dinosaur, an ancestor of T. rex. A Wild Safari Dinos Guanlong dinosaur model. A beautiful model of Guanlong a fierce dinosaur that was an ancestor of Tyrannosaurus rex. A hand-painted, Wild Safari Dinos Guanlong dinosaur model. A fearsome carnivorous dinosaur with a bright red head crest. This is a very dainty but nonetheless well detailed sculpt, with all the fenestra in the skull clearly visible, a ridged palate in the mouth and a tiny tongue, a bright crest and a fine covering of dino-fuzz. The paint scheme is very bold and relatively simple. I love the dynamic pose, which manages to be both menacing and somewhat comical! 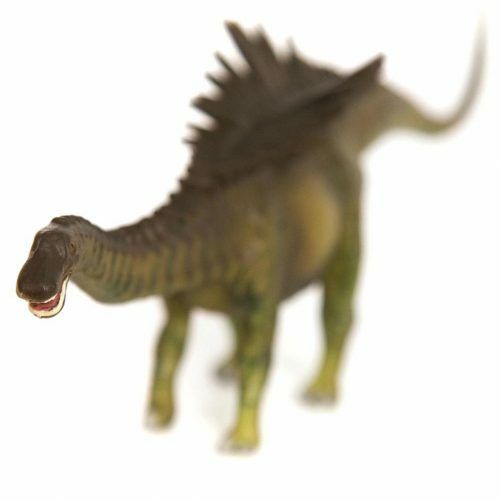 Your range is so wide our family could not think of anything else to suggest we love your extensive range of model dinosaurs.